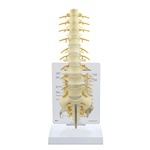 Highly detailed, life-size model shows all significant features for each vertebra, including vertebr This model includes Femur Heads, not pictured. This model features 4 pairs of life-size lumbar vertebrae in 3 stages of degeneration. Shown are a n Deluxe Muscled Cervical 172 Full size model features brain stem, occipital bone, atlas and axis thr Fully articulating model of L1 through L5 with sacrum. A herniated disc is shown between L4 and L5. Full size section with spinal cord and nerve branches. Bones featured are the sacrum, L-1 through L-5 vertebrae, and T12 through T8 vertebrae. 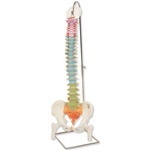 The 5 different sections of the spinal column differentiated by color on this spine model. One each of Cervical, Thoracic, and Lumbar Spine Models The life-size model of a human skeleton provides a high level of realism The life-size model of a human skeleton provides a high level of detail for students. This skull is flexibly mounted on a cervical spine. Also represent the hindbrain, spinal cord, cervical nerves, vertebral arteries, basilar artery and rear cerebral arteries.